Learning how to describe feelings and emotions and identify the moods of others are important keys to help your little one make friends, build emotional health, and become compassionate. 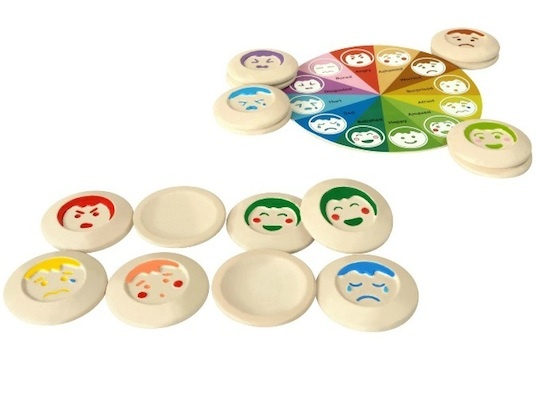 My Mood Memo, a matching set of twelve different emotions and a corresponding emotion color wheel, is a fun and sensitive way to help children comprehend these complex feelings. Created by Inhabitots favorite Plan Toys, My Mood Memo’s matching discs are crafted from sustainable rubber tree wood, vegetable dyes, and a non-toxic finish. Identified by St.David’s Center for Family and Child Development as a great toy and skill builder for children with autism, My Mood Memo’s cheerful colors and simple expressions make learning about emotions an approachable game for every child. If you purchase this learning toy through Creative Kidstuff, a toy will also go to a child in need! Learning how to describe feelings and emotions and identify the moods of others are important keys�to help your little one make friends, build emotional health, and become compassionate. My Mood Memo, a matching set of twelve different emotions and a corresponding emotion color wheel, is a fun and sensitive way to help children comprehend these complex feelings. Created by Inhabitots favorite Plan Toys, My Mood Memo's matching discs are crafted from sustainable rubber tree wood, vegetable dyes, and a non-toxic finish. Identified by St.David's Center for Family and Child Development as a great toy and skill builder for children with autism, My Mood Memo's cheerful colors and simple expressions make learning about emotions an approachable game for every child.